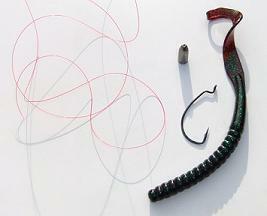 The standard Texas Rig is one of the most common and simple methods of rigging a soft plastic worm. 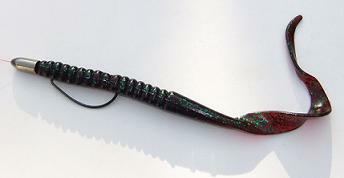 This weedless styled bait presentation is a very popular freshwater fishing rigging technique, especially for largemouth bass fishing, and is also well suited for a boat load of other species of fish, including the use of a wide variety of other soft plastic baits. We will briefly go over lure choices, hook selections, and types of weights. Then of course, we have instructions on how to get you rigged up, along with the option to learn additional tips and techniques for using this awesome rig. Just about all shapes, styles and sizes of soft plastic lures can be incorporated into the Texas style rig. Other than worms, lures such as plastic lizards, crawfish replicas, grubs, and tube baits are some of the best choices that work great. There are many styles and sizes of hooks that you can use. The hook should match well with the size of the bait. 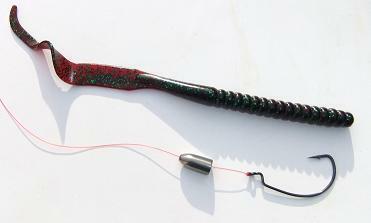 The larger the bait, the larger the hook, and vice versus. Some of my favorite styles of hooks that I like to use with this rig are the straight shank, tru turn, and the extra wide gap hooks. Bullet weights are the most popular to use. The most common materials are lead, brass, brass and glass, and my favorite, tungsten. Tungsten is a bit more costly, but is extremely strong. Using other sliding sinker styled weights as an alternative will also work fine. And a 3/0 EWG (extra wide gap) hook. Note: Select and use tackle most relevant to your fishing conditions and suitable to your style of confidence. Step 1: Run the bullet weight onto your line and tie off your line onto the hook. Step 2: Insert the head of the plastic worm into the hook. Insert only about a ¼" of the head through. Step 3: Continue pushing the head of the plastic worm in through the hook. Step 4: Pull the hook through until it is buried into the eye of the hook, and rotate the bait 180°. Step 5: Align the hook up with the bait to determine where the hook will rest, then penetrate the hook through the body of the bait. Step 6: Embed the hook point just under the skin of the worm. Step 7: This is the weedless style freshwater fishing Texas Rig. This is one of my most favorite fishing rigs to use, and I think that you will have a blast with it also. Interested in some more tips and techniques, and different methods for fishing this rig? Check out more information about Texas style Rigs.